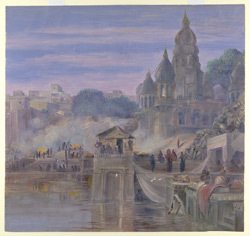 Oil painting on paper by Marianne North of the burning ghats at Benares, dated October 1878. Marianne North visited India in 1877-79 and completed over 200 paintings whilst there. Varanasi, the sacred city of Hinduism, is situated along the Ganga river. Every day its innumerable ghats or stepped banks are crowded with bathers as it is believed that the water of the Ganga purifies the souls of the livings and assures the liberation of the dead. Some of the ghats are used as cremation grounds. In her autobiography, 'Recollections of a happy life' of 1892, Marianne North wrote, "The burning-place looked picturesque after sunset, when the daylight was going; one could see the flames and smoke and dark figures against it, all reflected in the river, with the great odd-shaped temples standing out in the background, against the twilight sky, and all the big umbrellas against the walls, looking like targets. As it got dark the river front was lit up with oil lamps and fireworks, and was a splendid sight."